I will show you a simple system for preparing and delivering powerful Bible lessons — a system that has improved the teaching of thousands of people all over the world. It’s a step-by-step process that can be used for any type of lesson, from any part of the Bible, for any students that God provides for you to teach. 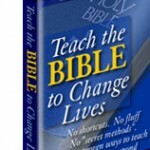 The Teach the Bible to Change Lives course prepares YOU to be God’s tool to change lives. You’ll know precisely what God wants them to learn. There won’t be any doubts in your mind about what you should teach, because God will have made this clear to you. God loves these people more than you do, and knows what they need to learn and be reminded of – at this particular time. They’re going to be ready (in fact, eager) to learn. Your teaching will be ten times easier when people want to hear it, and are prepared to live differently. You will learn the simple but powerful ways to build anticipation and eagerness and desire for learning in your students. You’ll be completely prepared to teach this material confidently, and powerfully. You will learn how to study the Bible to teach it effectively. There are specific strategies that will maximize the value of your limited study and preparation time. You’ll learn how to set up lessons with life-changing insights and application. You’ll be able to manage class/discussion time so well that no one will be watching the clock. You’ll have their attention from the first minute with your opening. You can draw even the most reluctant people into discussion, and steer people into the new understanding that God desires for each of them. And they won’t be ready to leave before you’re done.